For something straight never goes out of fashion and when it’s put together with a side parting it surely, adds a cherry on the cake. Recently, witnessed at the Oleg Biryukov Collection for Spring-Summer 2012 during Mercedes-Benz Fashion Week, the straight hair look won hearts. The models were an epitome of elegance and simplicity yet carried the look with lot of oomph. We swear by this hairstyle for a chic and uber-clean look, especially where you can’t afford to go wrong. Curls are commonplace and sometimes boring, but we decided to show you how sweet and snazzy straight hair looks. First choice for people maintaining long or medium hair, this one is good to go and stays till you shampoo again or have your sweat spoil it. After shampooing your hair, use a generous amount of conditioner optimum for your hair length but not excessive to make it greasy. Using a blow-dryer, dry your hair completely. Brush your hair to remove any tangles and keep repeating the same till you can run your fingers smoothly through your hair. Apply some shine serum on your hair and scrunch it so that it reaches the entire length. Using a hair iron, iron your hair till each layer is straight from the scalp to the tips of the hair. Using a tail comb, draw a line to divide hair into two sections. The line for side parting should be drawn above the arch of the eyebrow. Take the comb, from the starting to the end of the crown area and separate the hair into sections. Make sure to have the parting on the side you are more comfortable with and in the direction your hair falls naturally. 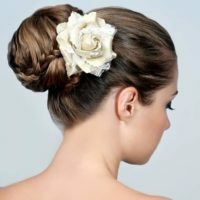 Use a spray or apply hair lotion in a very small quantity and rub it all over your hair, for the hair to stay in place. 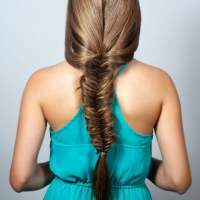 You can also go for a hair-product which has anti-frizz or adding volume specialties. The hairstyle is ready and you can comb again, to avoid any bumps. Make sure there are no tangles in the hair, without it the straightening shouldn’t begin. Be careful while using the hair iron especially with the small length front hair. It isn’t necessary to have a sleek-straight hair look, rather one can go for a natural looking straight look with the parting. If you don’t have long hair, try on clip-in hair extensions. Make sure that the clips are not visible and the texture of the hair blends well with your own hair. Just add a smile to this look, and you are ready to flash it!